We may need to check for a validated signature under specific situations or to trigger a related workflow. The signature field value changes according to whether it is valid or invalid. We can check this value in actions or validation settings dynamically. Add an Infowise signature field "Manager Signature" to your form. 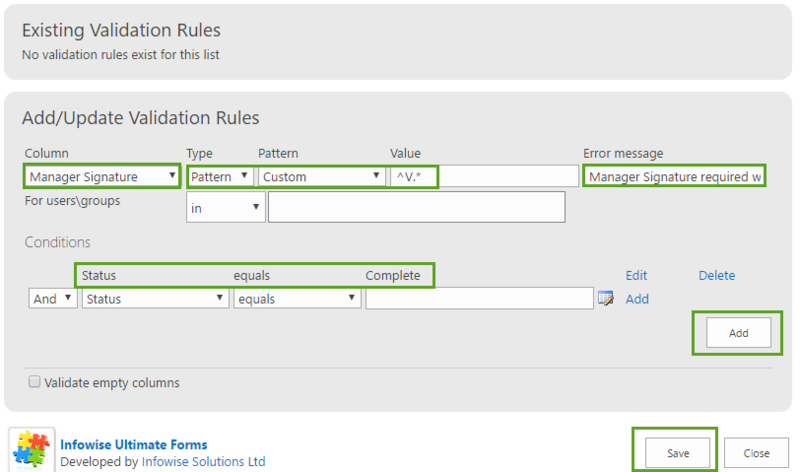 From the list settings menu, select Infowise column validation settings. Include an appropriate message for users when the validation is triggered. You may also add a condition and control when the validation should be checked. In this example, the validation will be checked only when the status = "Complete". Always check your validation rules to be sure that they work as expected. Sometimes pattern matching doesn't work exactly as you would expected. It can often be easier to make multiple pattern rules for one field rather than trying to determine a single expression which validates the field in all situations. When using the Infowise signature field, it is useful to check the signature using validation or when triggering actions. Using a simple pattern matching rule we can ensure that the signature is valid before allowing the record update.